Contests > Make this Mother’s Day a special one! Mother’s Day is just around the corner and we are celebrating the special lady in your life. Whether she’s your mom, mother-in-law or a mother-like figure in your life, make sure to cheer her on and remind her why she’s so special. Our newly created Mother’s Day page has fresh content for all moms. We have a special selection of recommended movies to watch with mom in addition to three exciting contests that will allow you to spoil her. You could win passes to see Book Club! 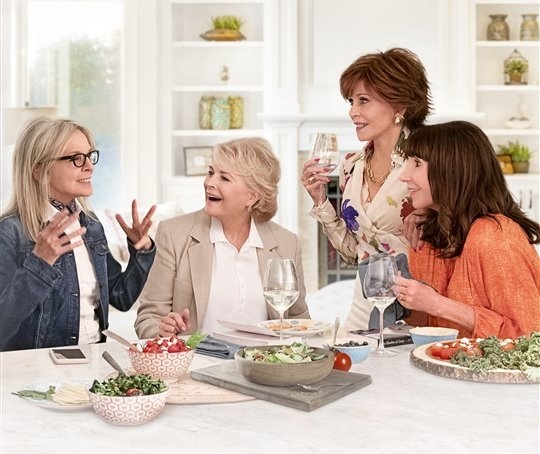 It follows the lives of four close friends ( Diane Keaton, Jane Fonda, Candice Bergen, Mary Steenburgen) and how their lives are turned upside down to hilarious ends when Vivian convinces the other three to tackle the infamous novel Fifty Shades of Grey as the selection of the month for their book club. From discovering new romance to rekindling old flames, they inspire each other to make their next chapter the best chapter. You could also win a Blu-ray of Fifty Shades Freed. Christian (Jamie Dornan) and Ana (Dakota Johnson) return from their honeymoon early only to find out that Ana’s old boss, Jack Hyde (Eric Johnson), is back in town to cause chaos in their lives. We are also giving two lucky winners the chance to take mom out for dinner with a $200 dining gift card as well as a Blu-ray set of the Fifty Shades collection. Feel free to comment below telling us the name of your favorite movie to watch with mom on Mother’s Day. So go ahead and check out our Mother’s Day page and enter our contests. Good luck and Happy Mother’s Day! my mum loves to watch the old classics like GONE WITH THE WIND! Steel Magnolias! Filmed in my mother’s hometown. I would watch a walk to remember with my mom! I would watch Pride and Prejudice. I got this one!!! We love love love the Joy Luck Club. Not only is it a movie about mothers and daughters (and my mother and I are just that LOL), but they do it against the backdrop of the ancient and wonderful game of Mah Jongg, which my mother taught me and we play as much as we can. This movie makes us cry EVERY time. It is sooooooo good. My Mom and I really enjoy watching “My Big Greek Wedding” – written & starred by our Canadian gal Nia and so funny and about family!!! My mom and I enjoy watching Date Night together. She laughs and laughs and laughs. One of our favourites is my Big Fat Greek Wedding. We would definitely watch An Affair to Remember. Classic movie and she loves the oldies. One of my favorites is Life as We Know It. We love to watch Fargo, an intriguing combination of humor and horror! My mom and I love to watch Going My Way together! New on DVD – Hostiles, Maze Runner: The Death Cure and more!